The report also comments upon how CinBA has been leveraged going forward and contains 10 key learning points highlighting how impact from Humanities research can be enhanced. 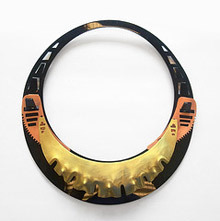 Creativity in the Bronze Age: A Response brings together works by seven craft artists working with CinBA. The exhibition is part of an ongoing exchange between academic researchers working in archaeology and contemporary makers / artists engaged in practice-based research. Vist the exhibition in Museum of Archaeology and Anthropology it Cambridge (10 April – 30 June 2012), Wiltshire Museum in Devizes (6 July – 6 October 2013) or follow the link to check out the on-line exhibition. 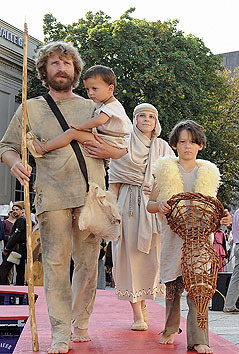 CinBA session focuses on creativity in the European Bronze Age. Studies of creativity frequently focus on the modern era, yet creativity has always been part of human history. The European Bronze Age is an extremely dynamic period. 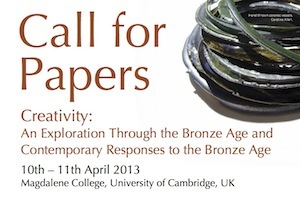 This session explores the ways in which the notion of creativity may be useful in unpacking the technological and stylistic underpinnings of Bronze Age material culture by investigating the relationship between creativity, material properties and change. There has been a trend within Bronze Age archaeology to discuss change and developments from a top-down perspective, for instance in terms of long‐distance exchange, settlement patterns and large‐scale technological trends. The macro‐analytical level implicated in using such a perspective has, however, tended to detract attention from the idiosyncrasies, affordances and potentiality of material culture itself; the objects that people made and used in their everyday lives. Recent bottom‐up approaches have begun to focus on Bronze Age craftspeople, and a discussion of shifts in material culture through the lens of creativity encourages investigation of their decision making processes and how these contribute to change and developments in material style. Placing the spotlight on creativity within craft illuminates how people were exploiting the potentials of materials and developing new ways of designing objects. It further directs archaeological narratives to incorporate discussions of how people were interacting with each other and developing the ideas that are encapsulated in their material culture. This session is organised by the HERA‐funded project Creativity and Craft Production in Middle and Late Bronze Age Europe (CinBA) . Bringing together partners from the Universities of Southampton, Cambridge and Trondheim, the National Museum of Denmark, the Natural History Museum of Vienna, Zagreb Archaeological Museum, Lejre Archaeological Park (Sagnlandet) and the Crafts Council, the project investigates creativity in the Bronze Age through pottery, textiles and metal. We welcome speakers from both inside and outside of the project working with these materials and others to present and participate in discussions of creativity, craft and developments in Bronze Age material culture. Karina and Helga held a fantastic Historical Fashion Show with over 100 people dressed up wearing costumes from the Stone Age through to Baroque! There was a big response via the media, before and after the show: Newspapers, Internet Articles, Blogs, Broadcasts and Interviews. Please browse the links below to get a feel for the atmosphere and achievements of this fantastic event. What fashion scientists would never dare! At the same time as we assume creativity as embedded in human history, it is unclear how we locate, explore and analyse creativity. The explicit aim of this conference is to engage with this challenge. We will discuss creativity through a focus on its outcomes – in this case material culture – and through an exploration of creative practice. The European Bronze Age provides an interesting focus for discussions of the outcomes of creativity because in this period we see the development of new and pre-existing materials that we take for granted today. We also see new ways of working with them, accompanied by the growth of technical skill, to produce complex forms and elaborate decorated surfaces. This conference will explore how viewing these through the lens of creativity has the potential to offer fresh insights into the interaction between people and the world. An understanding of creativity further demands that we examine the processes that lie behind creative expression. To consider this, the conference will explore how the distant Bronze Age may be able to act as a stimulus and inspiration for creative practice in the present. The project CINBA is financially supported by the HERA Joint Research Programme which is co-funded by AHRC, AKA, DASTI, ETF, FNR, FWF, HAZU, IRCHSS, MHEST, NWO, RANNIS, RCN, VR and The European Community FP7 2007-2013, under the Socio-economic Sciences and Humanities programme.